It may not be spring just yet, but there are ways to incorporate spring into your wardrobe while still dressing for the chilly winter temps! Bright colors and floral prints are the easiest way to put a little spring into your step! I fell in love with this vibrant, WARM coat when I first saw it. It’s the perfect coat for this time of year as it gives off such a fun pop of color. Pairing it with a bright pink beanie was a must! 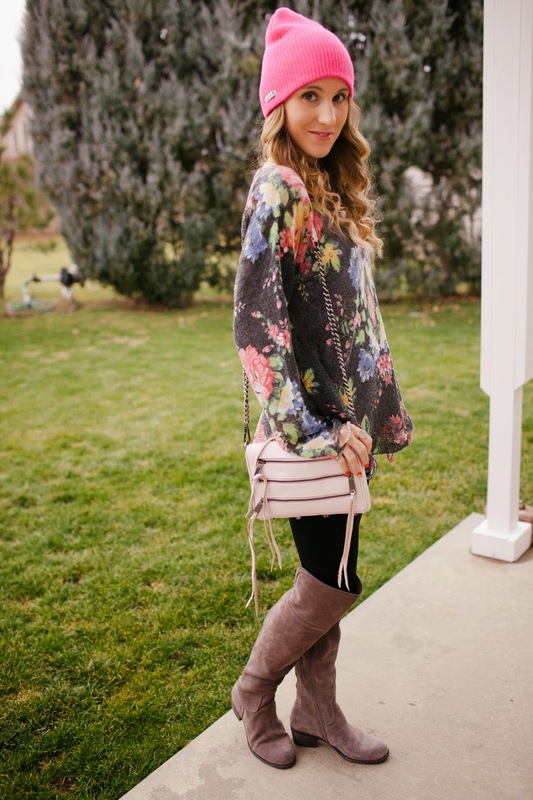 This fun, floral print sweater comes from PB&J Boutique, one of my new favorite little online shops! I love the mix of options PB&J offers from higher end to moderately priced with pieces from trendy to boho! Their new arrivals section is always filled with amazing finds….can I please add this and this to my closet ASAP?! that jacket is so fun!